Roulette is a gambling game played in casinos all over the world. 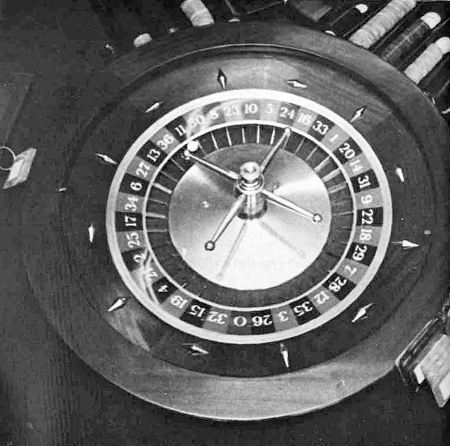 It is played with a roulette wheel which has a sort of clock-face with numbered slots all round it. A small ball is thrown into the wheel as it spins. The game is concerned with betting on which numbered slot the ball will come to rest in when the wheel stops spinning. The numbers are all either red or black in colour, and players can also bet on whether the ball will stop at a red coloured number or a black coloured one. Although Tom wasn't interested in gambling himself, he agreed to go to France with a friend of his, Tim, to try out an 'unbeatable' system for winning at roulette. N.B. You will notice near the end of the story that Tom accidentally says 'drowned' when he meant to say 'drown'. In the notebooks which they burnt in the wood, Tim had worked out the system he thought was unbeatable. You have heard Tom's story. Now answer the following questions. What did Tom's friend, Tim, think was an unbeatable system for winning at roulette? What was Tom going to get if Tim won money at the casino in Le Touquet? How did Tom and Tim get to somewhere near Le Touquet from England? How many passengers travelled on the plane? How did Tom and Tim manage to be away from the airport and on the road hitching a lift by the time the other passengers came along in their cars? The casino was nearly empty. Who was there, however, when the two students went in? What did Tom and Tim arrange about how long they would continue playing roulette? How did Tom and Tim lose all their money after ten to twelve? What did the two friends do with the notebooks in which Tim had worked out the 'unbeatable' system after they had lost all their money? Why was it a good thing that they lost the money, in Tom's opinion?